Pony bead crafts find their origins in the Indian jewelry that was created by American Indians of the north and southwest. Historically, the term 'seed bead' refers to beads less than 2 mm in diameter. The term 'pony bead' refers to beads of between 2 mm and 4 mm in diameter, however the pony beads that craft stores today sell pony beads are usually much bigger than that. Historic 'pony beads' correspond in size to modern size 6 to size 10 seed beads which means that they are usually two to four mm in diameter. If you a creating traditional pony bead crafts you might want to keep this in mind. To put it simply, the beads that are used for pony bead crafts are multicolored tubes of glass. These glass beads are sold in various thicknesses. Some of them are slightly oval in shape due to tumbling and polishing process. Larger than seed beads and smaller than crows beeds, pony beads are also known as size 5 or size 6 "E" beads. Pony beads were made prior to seed beads and were used extensively during the 1830's to 1850's. Pretty pony beads can be transparent, opaque, frosted or metallic in appearance, Pony beads come in all styles of finishes and are widely available at craft stores. Pony Beads can be used to create many different types of PONY BEAD CRAFTS including necklaces, bracelets and chokers. They are great to use as fringe accents on purses, amulet bags or earrings. A popular pony bead craft is to macramé pony beads together with black cord or hemp for a complex bracelet. You can also crochet them or macramé them into projects such as hanging plant holders and drawstrings for knitted ponchos. Perhaps the simplest of ponybead crafts is the pony bead crimp necklace, which is an ideal project for a beginner. This involves alternating colorful tube shaped pony beads with crimped beads. A crimp bead is a tiny circle of metal, like a miniature ring that is generally around 2mm in diameter. They come in many styles and metals including gold, silver, copper and base metals. Your first step on this pony bead craft is to purchase a strong beading wire such as Tiger Tail (which are three strands of stainless steel that have been braided together). 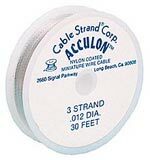 Similar beading wires are Acculon, Beadalon or C-Thru. If you prefer a softer touch you can also use Soft Flex beading wire that consists of seven thin braided strands of stainless steel. Most pony bead projects will recommend Tiger Tail wire simply because it comes in many different covers. This ensures that the color of your wire will blend in with the color of your beads. C-Flex beading wire also takes care of the matching the bead to the wire problem because it is plastic and see through. To complete this easy pony bead craft all you will need is about 2 oz of pony beads, two silver crimps and one sterling lobster clasp. You will also need 22 inches of beading wire. Simply string the beads on the wire, attach the crimps and the lobster clasp with a pair of pliers and you have a gorgeous necklace. An even simpler necklace can be made by simply stringing two or three pony beads on satin cord to make a choker. My FREE newsletter will show you new and forgotten arts and crafts tips, ideas, and suggestions.